I’m happy to hear you like it, Archita! So beautiful and have a wonderful Thanksgiving. Thank you, Ruth. 🙂 I hope you day is filled with family and good food. Thanks, Patrick! I’ll scratch Finn if you do the same from us for Maggie. 🙂 Happy Thanksgiving! What I find most interesting is all the wood scattered on the beach. 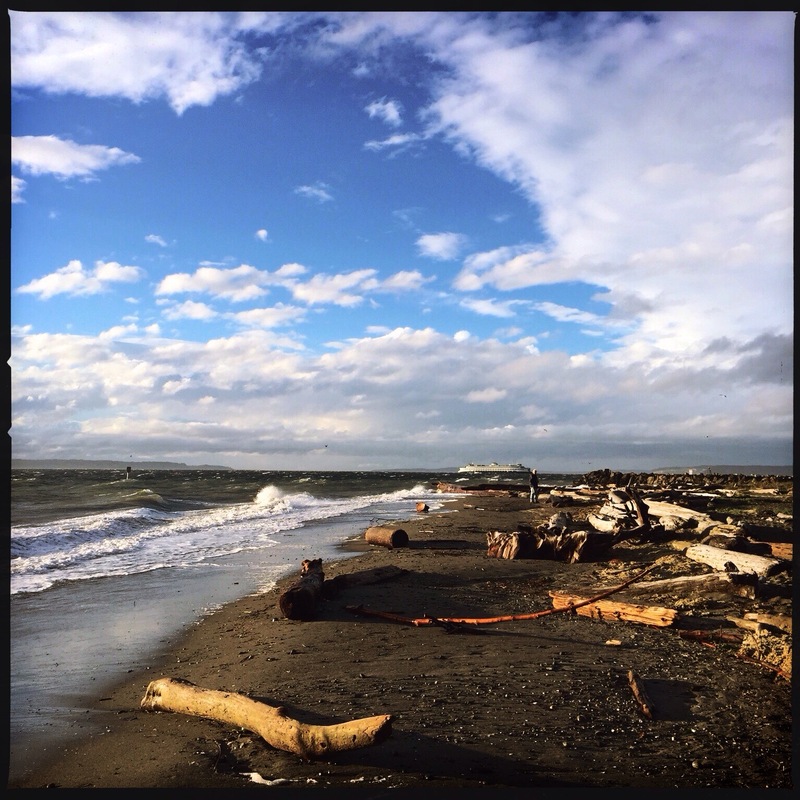 Wow – is there really that much debris that washes up on shore? Yes, most beaches around here are filled with these huge logs, Joanne. They make great “beach chairs” and fun obstacles to walk and balance on. 🙂 It comes from having so many miles of forested coastline. When the trees fall they go right into the water. I’ve never had the pleasure of exploring a beach like that. I really must put visiting the west coast on my to-do list!! Let me know if you make it out this way! What a great capture! Love the similarities of patterns in sky and waves. Thanks Melissa! This was one of those breakthrough weather moments when the sun came shining through clouds at the perfect time after a dark and stormy day. It was so nice to see light again! That’s a great photograph. Love the contrast of dramatic elements, sky, sea and shore. I also can’t help but notice that’s a nice looking lot of potential firewood just lying on that beach. A-ha! I see. Well, at least they made for a dramatic picture.